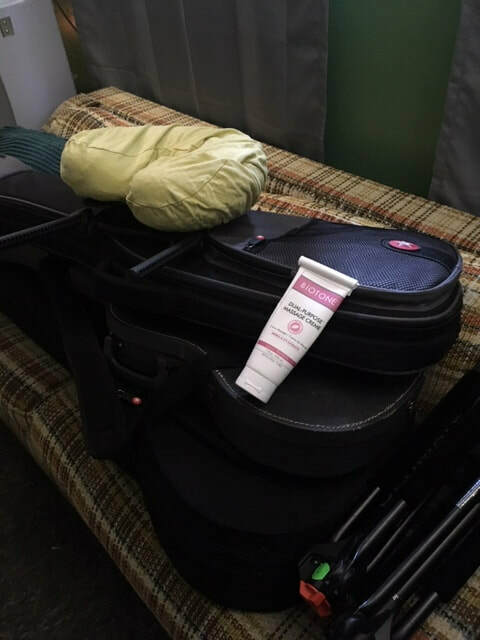 Katie Sachs, in partnership with The Grey Eagle, are excited to provide convenient, quality, "on call" body work, specialized for touring musicians! ​"Come, all you weary travelers..."
As a professional musician, and former touring artist herself, Katie understands the strains of life on the road, and how it can impact us on an emotional, physical and energetic level. Sessions are tailor made to support each individual and their specific needs: be them low back pain from sitting in a tour bus, strained forearms from playing guitar, or stress and anxiety from, well, being a highly sensitive artist and human. We also use music as part of the healing process, so expect a massage music playlist a bit more adventurous than Enya and nature sounds (unless you want that, which is totally fine too :) Katie is also certified in Reiki I and II, and can add this, as well as aromatherapy, to any massage for just an additional $10. If two people in your band want massage, take $5 off the listed price of each service OR get a free add-on! ​For larger groups: If 3 or more people in your band want bodywork, chair massage is highly recommended, due to time. Pricing negotiations can be made on a case-by-case basis. A minimum of $80 worth of work is required. *If you need to cancel after we have confirmed you appointment, you will be charged half the price of the massage. *If you arrive LATE to your appointment, the minutes you are late will be deducted from the time of your massage, You will be charged for the minutes you originally booked for.